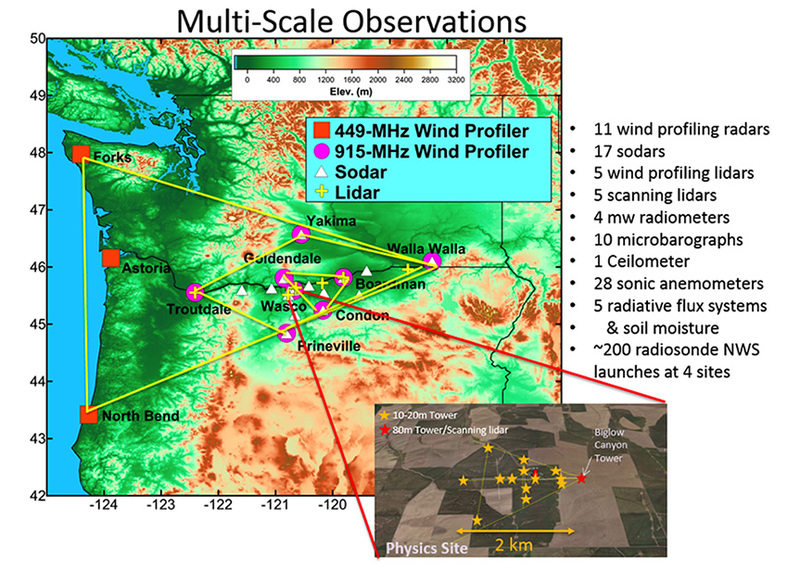 In support of WFIP2’s goals, participants have conducted a field campaign in the eastern Washington and Oregon Columbia Basin to assess how physical processes over a broad range of spatial scales alter wind speeds across the rotor diameter. The overall design for WFIP2 focuses on a set of weather phenomena that poses particular challenges for wind and wind power forecasting in the complex terrain of the Columbia Gorge: frontal passages with stable mix-out, gap flows, convective outflows, mountain waves, topographic wakes, and marine pushes. In addition to these specific phenomena, the Columbia Gorge area poses amplified challenges in general for numerical weather prediction models, owing to the Columbia Basin’s moderately complex terrain and the Cascade Mountains’ highly complex terrain just to the west. While these phenomena receive particular focus, the field study has generated a comprehensive dataset, covering a complete annual cycle to allow evaluation of models and parameterizations over the full spectrum of atmospheric conditions. Through WFIP2, the team is developing physical modeling methods and atmospheric theories that can be incorporated in foundational weather models to improve wind forecasting. The results of implemented changes will be evaluated through assessing improvements in forecast skill and the economic impact of these improvements. Finally, a set of decision support tools will be developed to facilitate the operational use of the improved forecasts. WFIP2 represents a partnership of industry, academia, and federal laboratories. Vaisala was awarded industry leadership in the project. Vaisala team partners include: Bonneville Power Administration; University of Colorado, Boulder; Lockheed Martin; National Center for Atmospheric Research; University of Notre Dame; Sharply Focused; and Texas Tech University. Industry data partners include: Eurus Energy, Iberdrola Renewables, NextEra Energy, Portland General Electric, Siemens, Southern California Edison, and White Creek Wind. National Oceanic and Atmospheric Administration (NOAA) participants include: Air Resources Laboratory, Earth System Research Laboratory, and National Weather Service. U.S. Department of Energy participants include: Argonne National Laboratory, Lawrence Livermore National Laboratory, National Renewable Energy Laboratory, and Pacific Northwest National Laboratory. A large, diverse suite of meteorological observing instrumentation has been deployed for WFIP2, including wind profiling radars, sodars, profiling and scanning lidars, microwave radiometers, microbarographs, sonic anemometers, and surface energy balance systems. The instrumentation has been deployed in a telescoping multiscale approach with a larger-scale array of profilers roughly 500 km across; a smaller array of most remaining instrumentation in a 200-km trapezoidal region; a smaller triangle of profilers; and some instruments nested inside a 2 km x 2 km highly instrumented area, referred to as the “Physics Site.” A KMZ of the instrument locations is available, as well as a table summarizing the most important metadata. In addition, the NOAA/National Weather Service launched approximately 200 radiosondes on selected days simultaneously from four sites: Seattle and Spokane, Washington and Salem and Pendleton, Oregon. 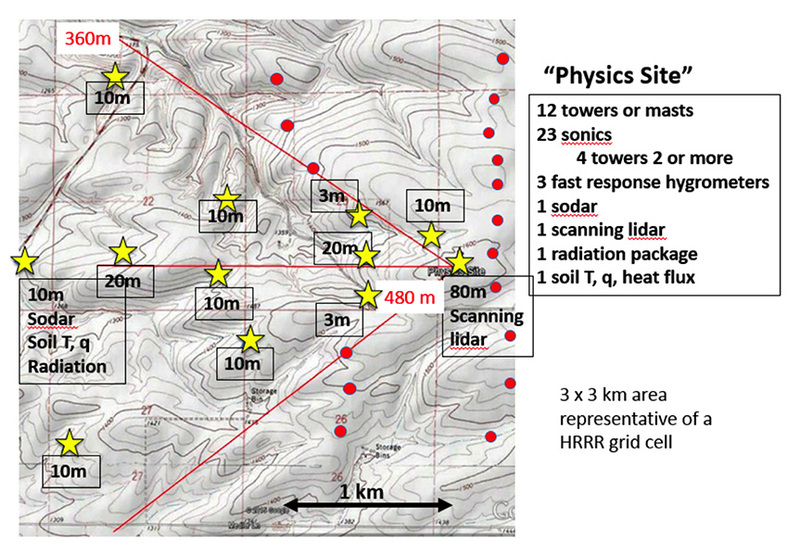 The Physics Site map shows the instrument locations with the deployment list (at right), including 12 towers or masts, 23 sonic anemometers, a sodar, a scanning lidar, radiation, and soil profile and flux measurements. The site is approximately 2 km x 2 km and was meant to provide area averages of fluxes approximately representative of a High-Resolution Rapid Refresh (HRRR) 3-km grid cell. The topography is gently rolling with approximately 120 m elevation difference between the high (480 m) and low (360 m) points across the area terrain. Wind turbines are indicated by red circles. As noted, a primary goal of WFIP2 is to improve model forecasts of wind speeds in complex terrain. To support this effort, a real-time provisional version of the 3-km HRRR model, with a concurrent 750-m nest, was run twice daily to compare with the operational HRRR, aid in event classification, and help with the diagnosis and attribution of model errors. This provisional model was used to test a variety of modifications to the boundary- and surface-layer schemes, as well as to the model dynamics, such as advection and alternative vertical coordinate systems. Because the experimental model often used early prototype source code, the forecasts were not archived, but the initial and boundary conditions were saved for future research. The event classification and forecast-error diagnosis led to the selection of important case studies that were determined to be both important and challenging for wind-energy forecasting. These case studies were central to the testing and development of new model physics. Thus, they were archived in the DAP. Please refer to the PNNL section of the right sidebar for data access instructions. After the field study was completed, the set of mature model physics developed during the field study was further tested in two contexts: (1) 10-day retrospective periods, using the Rapid Refresh (RAP) and HRRR frameworks (with 750-m nest) with cycling and data assimilation, and (2) a year-long reforecast without cycling or data assimilation (i.e., cold-start simulations). These testing approaches did not capture all of the model components developed, but they nonetheless should serve as robust representations of the overall developmental achievements made during the field project. These experiments also will be archived within the DAP. The table overviews the complete set of WFIP2 model data to be archived within the DAP. A more complete description of the WFIP2 modeling component is available here.